Big thank you to Felix Raspall (http://www.felixraspall.com/) and Alexis Schachter from monoblock. Without them, my trip to Buenos Aires would certainly not have been as enriching and enjoyable as it was. So again, thank you to both of you!!! 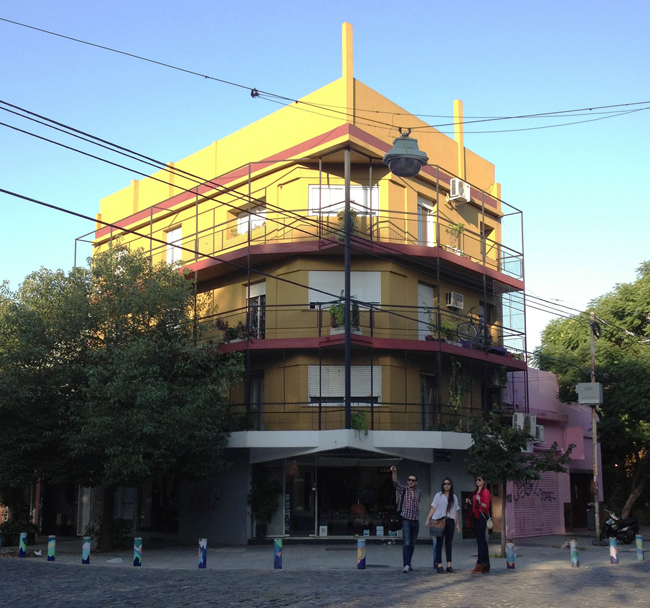 This day was all about Clorindo Testa, arguably one of the best well-known Argentinian architects (who passed away one day after I left Buenos Aires! The world has lost yet another great mind.) First, I went to visit the Banco de Londres y América del Sud and then took a metro to visit the National Library. These two buildings will stay in my memory for ever. I briefly saw the Banco a couple of days ago, at the end of my day, but I could not go inside at that time, so this was my second encounter. I remember the excitement I felt when I first saw it! One does not actually see it well from a distance, the building only slowly reveals itself upon arrival. What appears solid and impenetrable from afar becomes porous and almost transparent when viewed up close. When finally confronted with the menacing corner overhang, the building turns from threatening to enticing within seconds. 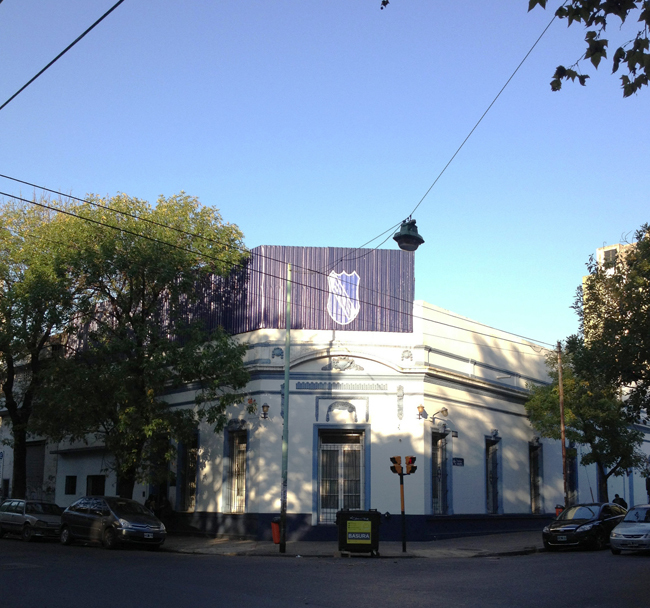 Opaque – transparent, exterior – interior, autonomy – engagement, radicalism – pragmatism, art – capitalism, these are but some of the dialectical pairings the Banco de Londres y América del Sud in Buenos Aires is successfully straddling. Or perhaps one could say it embraces both sides simultaneously, and with such ease that the seeming differences dissolve. The building is an invader, an alien, that doesn’t quite belong, yet at the same time has managed to (somewhat roughly) assimilate into its surroundings. An autonomous object that is also contextual. 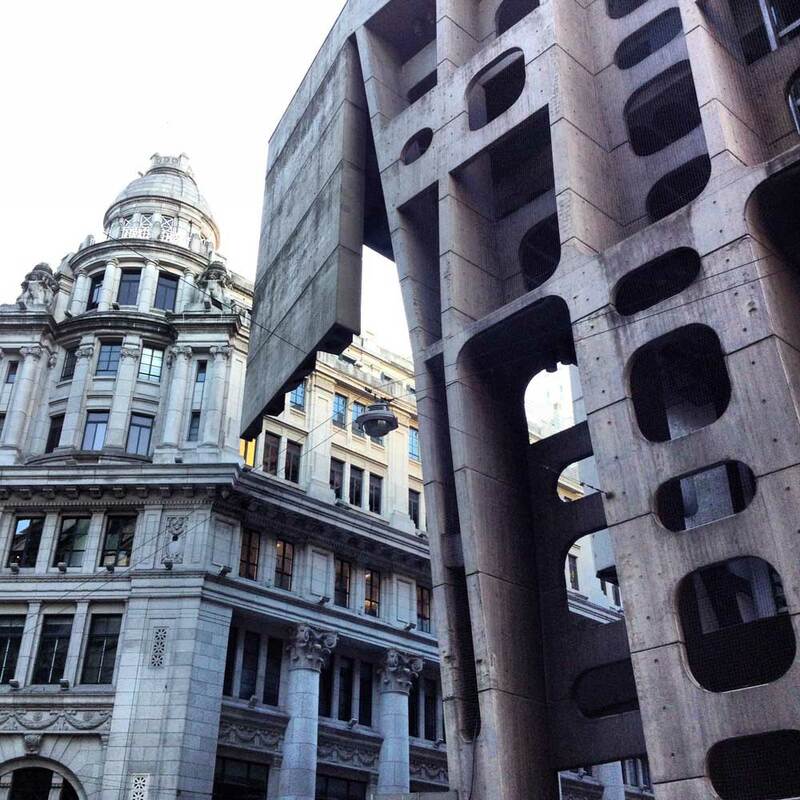 A radical work of architecture, sometimes even called art, supported by British neoliberalism (the client was the Argentinian subsidiary of Lloyds Bank). But how is it so? How does one resolve such inherent contradictions? Much of the richness and dexterity of the Banco can be attributed to the extraordinary envelope system. The porous and slightly undulating exterior is in stark contrast to the impenetrable neoclassical facades of the surrounding buildings. Neither a system of columns, nor walls, the exterior is a hybrid between the two, an innovative concrete lattice that acts as the main structure and protects the interior glass box behind it. I actually did have a chance to go inside this time, but after managing to take a couple of pictures, I was cordially thrown out of the building by the guard. However, even the few minutes were enough to see that the building is just as sophisticated on the inside as it is on the outside. Centrally located floor ‘trays’ never actually touch the perimeter building, so they appear to be hovering in the middle. But the most striking and unexpected features of the interior is the view outward from within. It is as if the entire curtain wall disappeared and one is left bare inside the protective skeleton, a spectator peering through the amorphous holes of the reinforced concrete; removed, yet very aware about the city and buildings around. One of the mechanisms the Banco communicates with its context, and at the same time separates itself from it, is through the use of reflection. The glass behind the almost overpowering concrete screen, the same layer that visually ‘disappears’ from the inside and that no one pays much attention to, acts as a mirror when viewed from the outside, duplicating the adjacent context. It is subtle, yet powerful enough to make it impossible to perceive the Banco as an isolated object; it belongs to a larger system – the city. It’s ability to oscillate between autonomy and engagement is fascinating; the radicalism and sculptural quality of the pour-in-place concrete set the structure completely apart from its neighbors, whereas the regularity, transparency, and reflectivity of the curtain wall make it resonate with the buildings around (of course the contextual height lines on each street help as well). 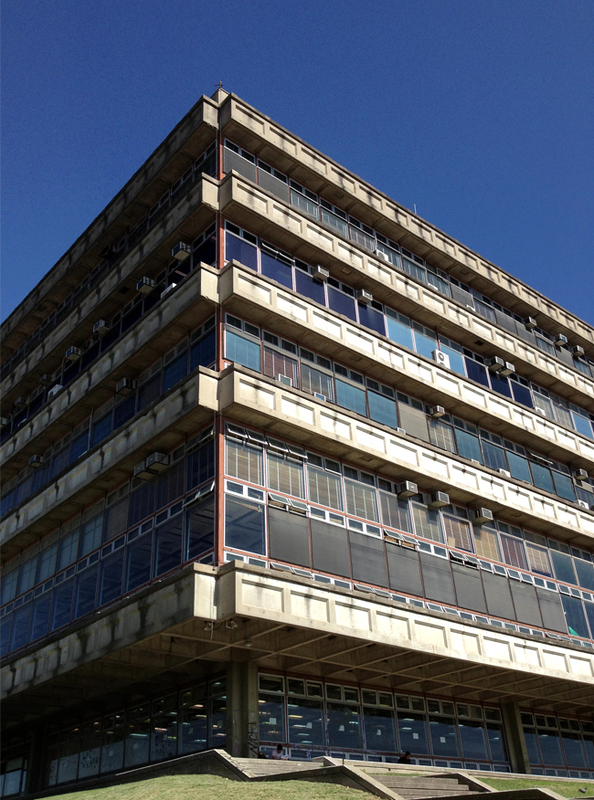 Currently the headquarters of Banco Hipotecario, the building was constructed between 1959 and 1966 through collaborative efforts of Clorindo Testa and SEPRA. 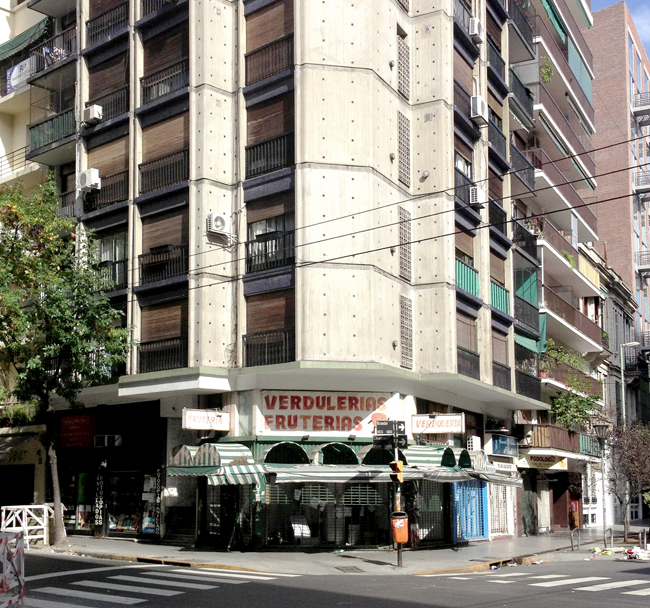 Located in the financial district, on a corner of Reconquista and Bartolome Mitre, the structure builds upon the somewhat unique local typology of chamfered urban blocks, which I already mentioned in my previous post (seehere). 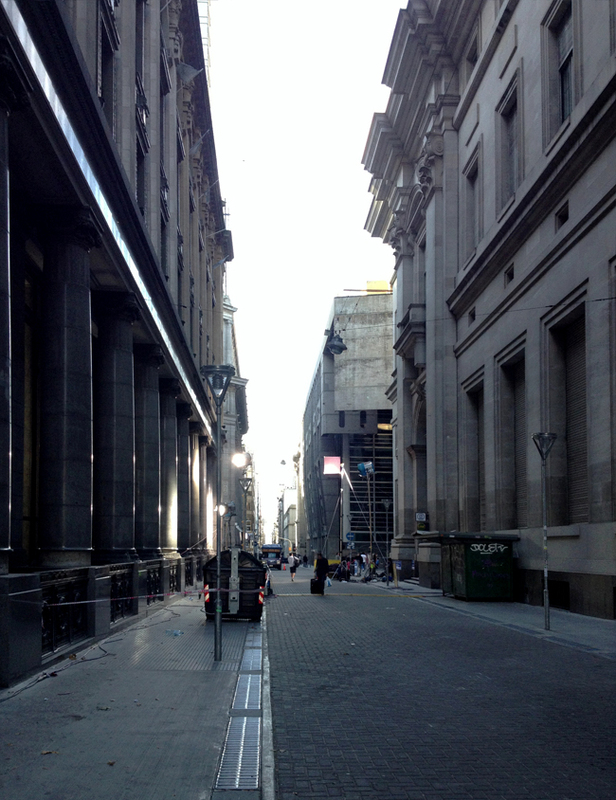 The entry to the Banco is actually a giant void. Differentiating itself from the adjacent buildings by this aggressive formal gesture, it also attaches and merges with the street by providing an open semi-plaza. Reminiscent of a submarine, or better yet a spaceship, the entire structure is permeated with various nooks, protrusions, and pieces of machinery painted in bright colors. While futuristic in its detailing, there is a primordial quality the building possesses. Like a prehistoric animal, the giant overhang could be misread as a cross section through a whale with exposed ribs right above one’s head, its skeleton carefully encrusting the precious content inside. After all, it is a bank. The traditional image of strength and security is merged with a more contemporary one of openness and transparency – an excellent image for a bank’s headquarters. 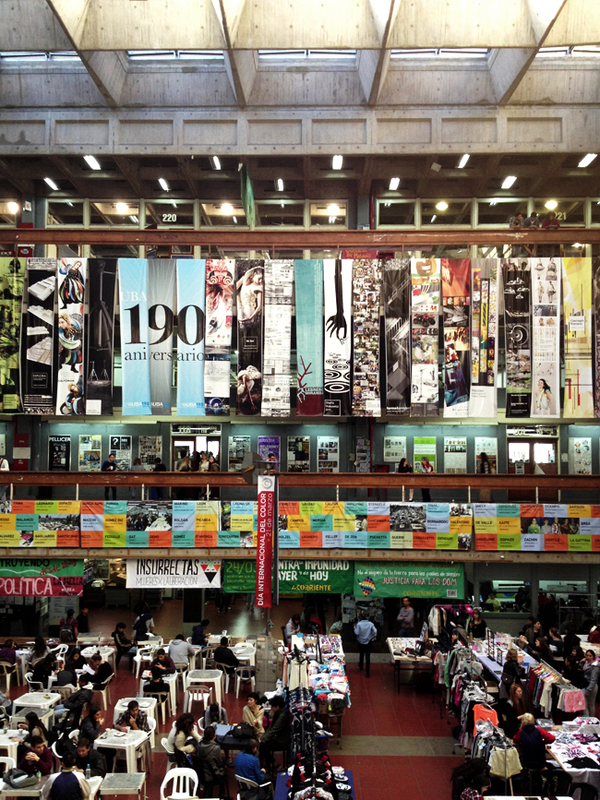 Today I visited the University of Buenos Aires (UBA), The faculty of Architecture and Urbanism. 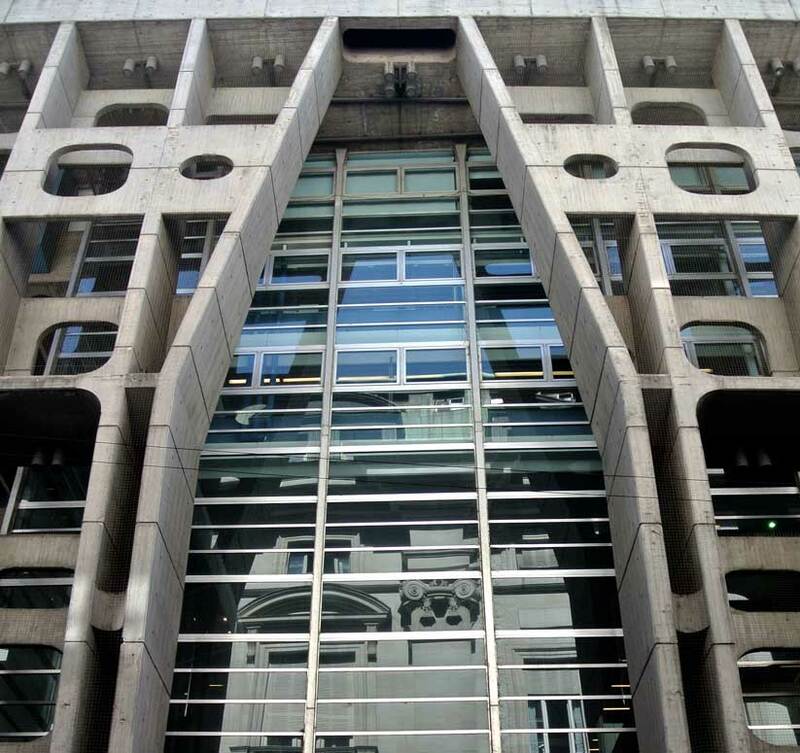 What looked from the outside like a giant modernist slab building with repetitive façade, with an interesting corner condition (always perceptive of the corner), it was a whole other story on the inside – incredibly lively and chaotic. I did not expect it at all. 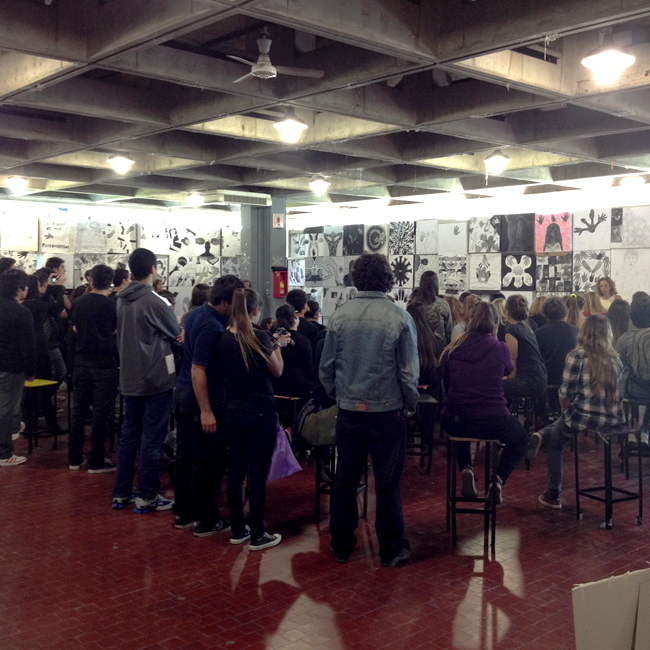 It was partially because of its architecture, but mostly because of its occupants, the students. 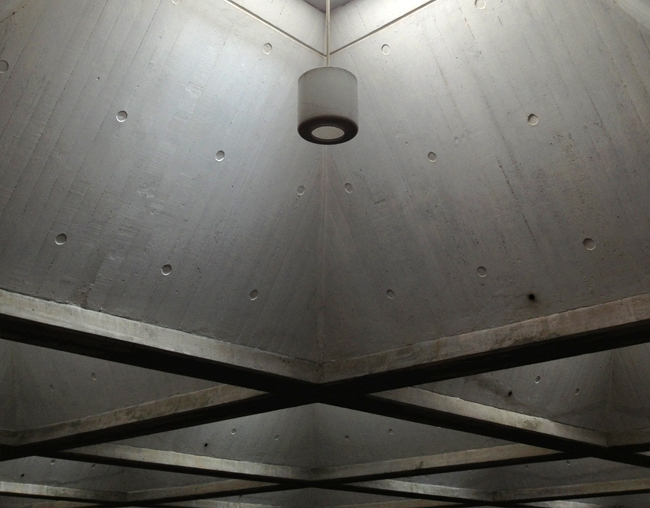 Architecturally, the most striking feature of the entire space was the ceiling. 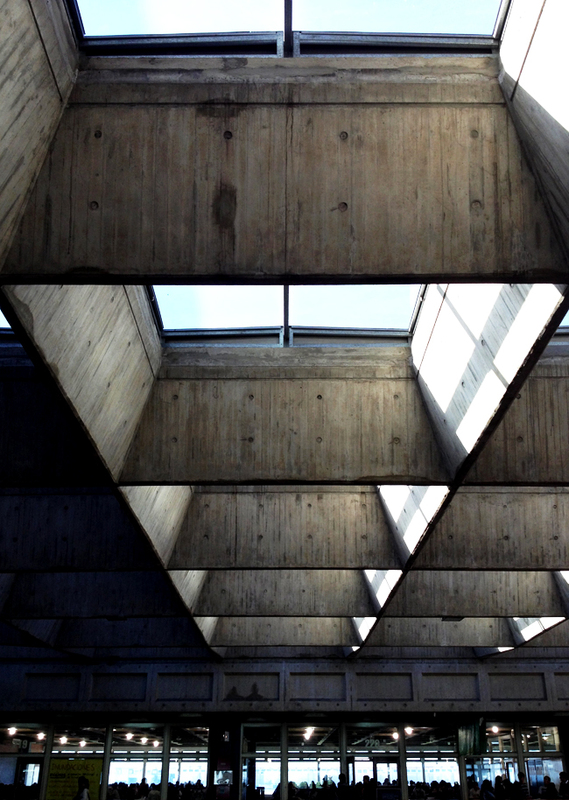 A version of Louis Kahn’s British Arts Center (BAC) ceiling in New Haven, it was composed of an extensive grid of concrete coffers, but despite the rough texture, it look more delicate than BAC's, and quite honestly, I was fascinated by it. It was immense! But it worked extremely well with the scale of the open space, filtering light in just the right amount. The central void looked like an enormous colorful living room, with banners hanging from the adjacent ramps, students studying, making models, eating, selling their work (I assume they were industrial design students), but mostly just chatting and hanging out at the bottom of the ‘pit’. There was so much energy buzzing in the air! 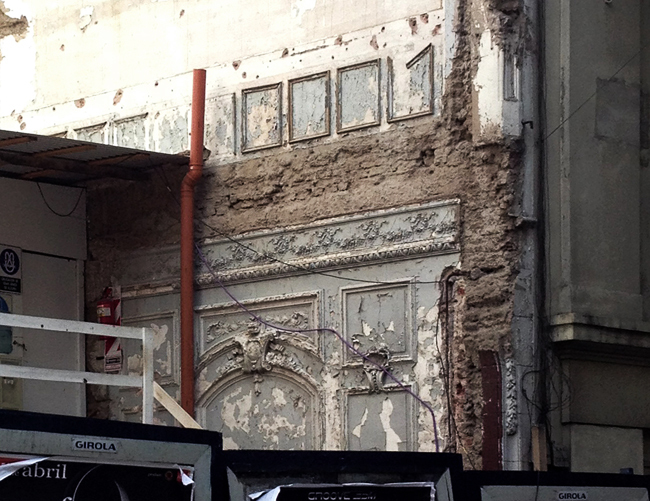 During my walks through the city, I noticed several places where old buildings were torn down and the gaping voids were waiting for a new building to complete the street façade. I’m not sure why these forlorn places caught my attention, obviously this occurrence is not unique to Buenos Aires; it happens in almost any city in the world. But here, since most of the buildings are party-wall construction, one could clearly see traces of the room subdivisions and interior decoration of the demolished houses. A peculiar scene, as if the building was still there, but not there. It is unlike in Tokyo, for example, where each building is separate from its neighbors, and therefore no trace remains after it is gone. Some of the walls I saw had highly decorated surfaces - moldings framing the perimeters of the non-existent rooms, wallpaper, etc. It made me thing about time and life of buildings. How do we decide what stays preserved? What should get demolished and replaced? How do we put a value on a building? Is it its age? Is it its historical relevance? Is it its present ‘usefulness’? Or is it that sometimes, when everything around gets ‘uplift’, the building simply does not fit into its surroundings and must go? 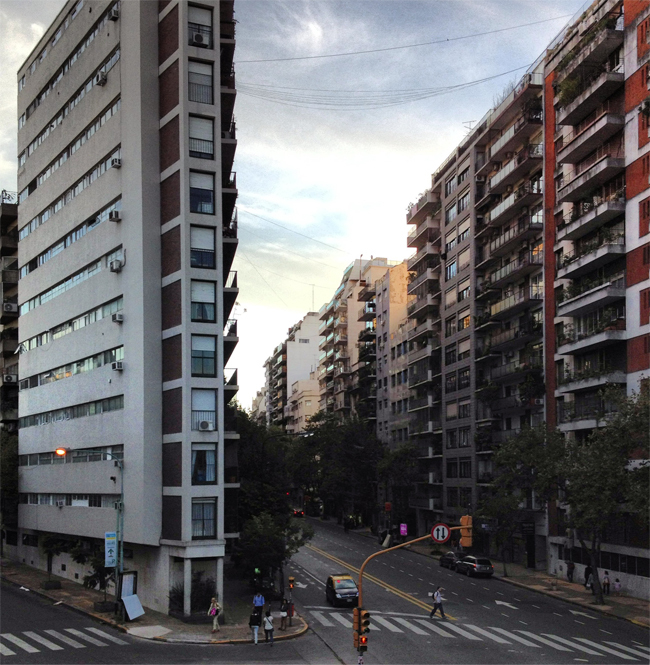 Buenos Aires has quite a unique urban typology. The urban block is not a typical rectangle in plan, but one with chamfered corners. Now, one might say, well that’s not really that new, Barcelona is the master of chamfered corner blocks (providing a decent public space, a sort of mini-piazza or square in the middle of each road intersection). 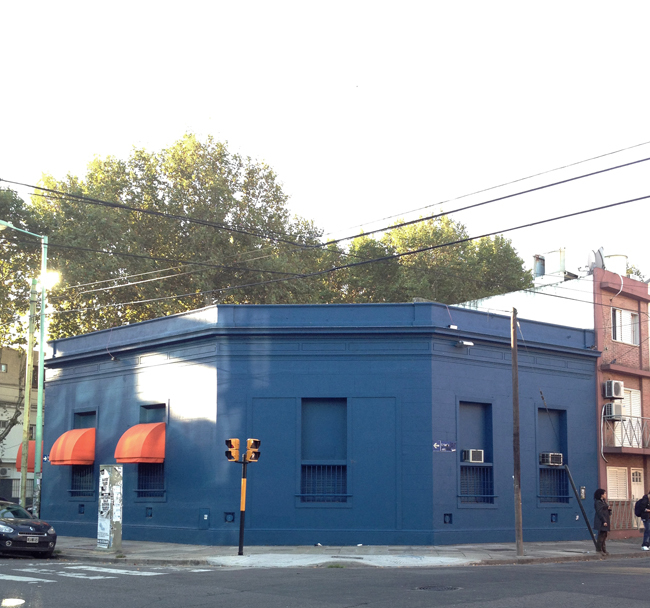 However, the urban blocks in Buenos Aires are chamfered on a scale of an individual building, rather than several buildings creating the face of the chamfer. This perhaps creates somewhat awkward interior conditions, especially for the new condominium developments that are sprouting around the city since it is not the most efficient use of the interior space, but quite unique spatial opportunities on an urban scale arise. The argument, supposedly, is that it provides greater visual access for incoming cars (hence there are very few traffic lights in Buenos Aires, except large avenues). Additionally, where before there were mostly private residential entrances, today typically a retail entrance or a large display window occupies the chamfered face, since it has a prime visual access from all points of the intersection. What is fascinating is the multitude of ways the buildings complete the street corner! One could construct a great catalogue of round-fillet corners, forty-five-degree corners, missing corners-voids, corners with cantilevered volumes, corners with a free standing column (apparently illegal these days), etc. 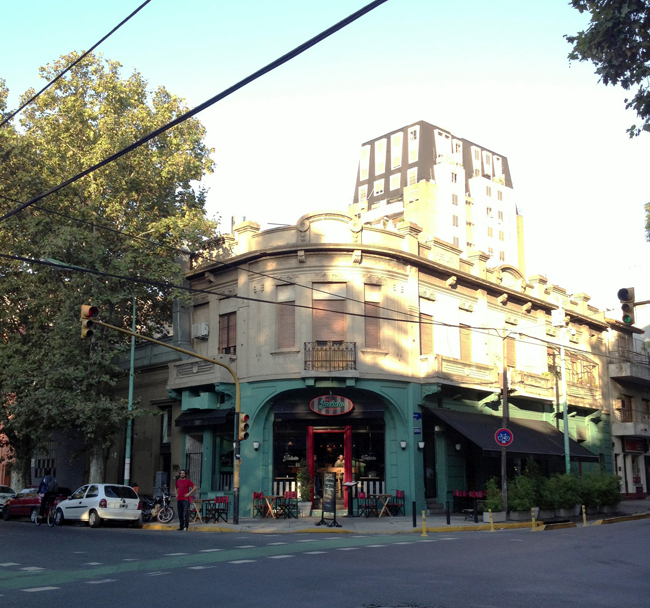 Back on the road… This is my first day in Buenos Aires and my first day of the Winchester travels overall. So far, I really like the city. It feels very European, which I’m not surprised, but it’s much more heterogeneous. Today I mostly walked through Palermo and Recoleta, which are considered one of the nicest areas in the city (and of course the most visited by tourists). As I mentioned, the city fabric is more heterogeneous than a typical European city. Eight-twelve story apartment buildings are intermixed with one-two story buildings with a more colonial flare, which results in a great visual variability and brings a lot of energy to the streetscape. Streets are lined with trees and parked cars, retail space typically occupies the first floor of the buildings, and graffiti is covering almost all surfaces within human reach. However, despite the heterogeneity in street section and elevation, the city could not be more homogeneous in plan. Everything is laid out on a shifted grid (which of course makes the navigation through the city very easy). 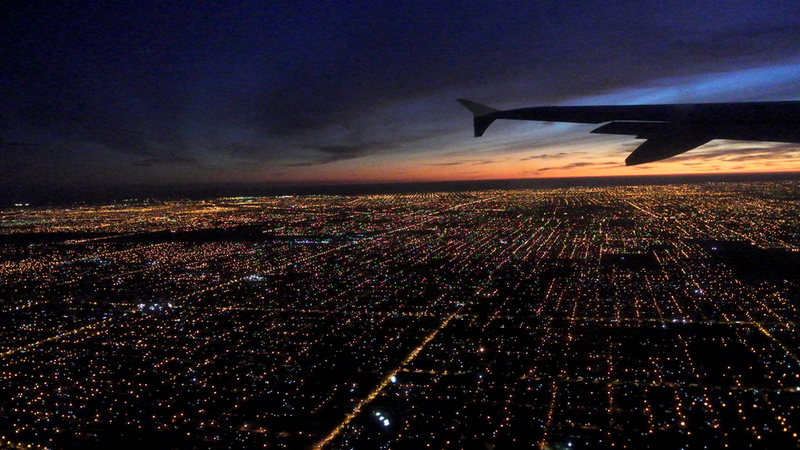 But I was struck by the uniformity of urban fabric when arriving on the plane late at night. Buenos Aires looked like a glowing checkered table cloth, nicely laid out, covering an incredibly flat and expansive area at the edge of Rio de la Plata basin - one of the largest river basins in the world.